At the risk of sounding shallow, the exhibition Ruin Lust seems to arrive 3 or 4 years late. Not that I would wish to equate art with fashion and its whimsical fads, but the obsession with the ruins of Modernism that ruled sovereign in the kunsthalles and smaller museums of Europe circa 2010 now feels, rather aptly, like a ghost vanished in the fog. Having said that, one ought to be aware of the timelines with which institutions such as Tate work, turning them into slightly ossified infrastructures that react with unavoidable delay to artistic and intellectual currents, like a slow giant chasing a nimble faun (which I guess in this silly metaphor would amount to artist run spaces or even some commercial galleries). On the upside, its co-curator Brian Dillon, whose exhibition-making career is gaining momentum (with other recent projects under his belt such as the Hayward Touring Exhibition Curiosity: Art & the Pleasures of Knowing). Dillon, a writer of exquisite melancholy taste and even sharper mind, is what you could call a “ruin expert” (a sort of Dillon des ruines). His novella Sanctuary (2011) recounted the tragic fate of a woman searching for her lover, a ruin hunter disappeared in strange circumstances, while his edited book Ruins, part of the Whitechapel Documents of Contemporary Art series, is a valuable reader for all things ruination and decay. And his knowledge and enthusiasm for his subject shows, both in the exhibition and its accompanying essay, a textual folly in itself. Dillon’s essential thesis, in a rather Robert Smithson-esque vein, is that ruins bear witness to our past but also prompt us to the future, dislocating our sense of time, and that from these monuments to destruction a potential for creation can emerge.
. 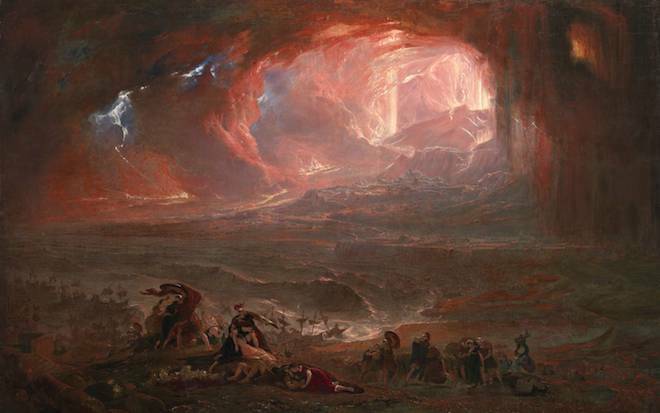 There is nothing quite like looking at John Martin’s awe-inspiring depiction of this ancient catastrophe in “the flesh”, after its recent restoration. The painting is the very definition of Edmund Burke’s sublime: beautiful and horrific in equal measure, showing how small and powerless human beings really are in the face of a natural disaster, and I was taken to think how much, like a blockbuster film avant la lettre, this painting must have captured the imagination of its viewers in the 19th century. 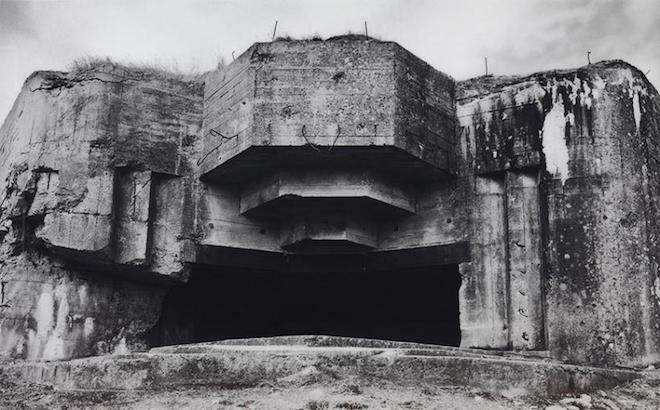 Opposite to it sits Jane & Louise Wilson’s large format photograph Azeville, which portrays an imposing Nazi concrete bunker embedded in the coast of Normandy, appearing in turns like a landed ship from outer space or a strange cave belonging to a civilisation that could either be extinct or yet to arrive. The Gothic remnants of Tintern Abbey, as seen by Turner, complete the room. This is a picturesque rendition of a decaying medieval church, long-claimed by the Welsh landscape; a vision which seems erected already in decay, its ideal state that of the ruin rather than as a fully functioning religious space. 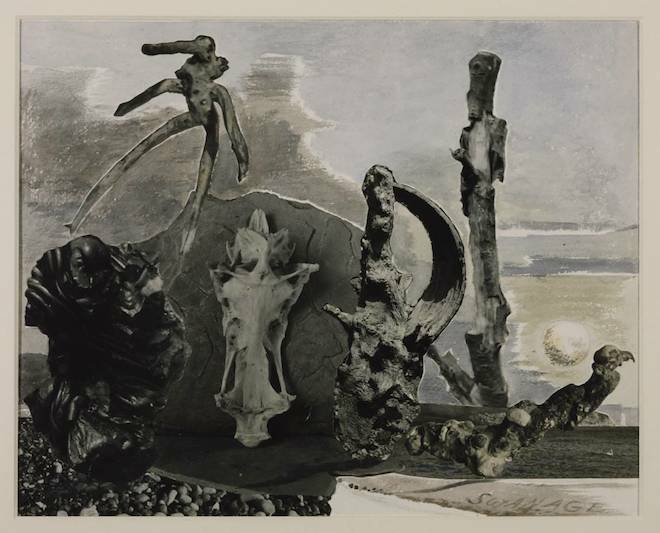 There are other splendid works in the exhibition, and favourites of mine include Paul Nash’s “seaside surrealism” photographs depicting objets trouvés in Swanage, in the cost of Dorset, which juxtapose rocks, tree trunks, body parts and human constructions in a continuum that obliterates the distinction between nature and culture, between the organic and the man-made. Equally stirring is Eduardo Paolozzi’s Michelangelo’s David (1987) a cast of the head of Michelangelo’s icon sawn into pieces and reassembled with ropes, like a miniature construction being refurbished. Or Laura Oldfield Ford’s large oil painting TQ3382: Tweed House, Teviot Street (2012), which shows two women hanging out in a bedroom. The interior setting and pink hues suggest something feminine and cosy, but on close inspection the domestic space reveals itself a decaying housing estate, whose concrete slabs seem to oppress and confine its inhabitants. All in all, Ruin Lust is an irregular exhibition, with very strong moments followed by rooms with works that fall flat, smothered by its curatorial theme and powerful yet overbearing title. While there seems to be not enough works that address ruins beyond architecture or place (psychic ruins, for example, or popular culture ruins), there is, no doubt, something compelling about Brian Dillon’s ruminations on ruination: Men might have conquered space, managing to travel the world in little time and to occupy various geographical coordinates simultaneously thanks to technology. But what about time? Time still escapes the control of human beings. Time, indeed, will be the end of us all, which is what makes ruins so fascinating to contemplate, now and always.